Madison County, through partnership development, stakeholder engagement, education and outreach, and on the ground projects. The Ivy River Watershed serves a vital role to communities in both Madison and Buncombe Counties. One of the largest tributaries of the French Broad in Madison County, it is used for fishing, swimming, agriculture, and drinking. In the late 1990’s, the watershed became a water supply source for the Town of Weaverville, NC and more recently a backup water source for the Town of Mars Hill. Since that time, continued progress has been made toward maintaining and improving water quality in the watershed. Landowners have worked with local agencies and groups to eliminate many sources of pollution in the watershed. However, water quality monitoring results show that continued efforts to protect water quality are still needed. Ivy River Partners was formed in 2014 to address this need. In 2013, Mountain Valleys RC&D and Madison County Soil & Water Conservation District completed a Source Water Protection Plan for the Ivy River Watershed. This plan identifies potential sources of contaminants and lays out a series of strategies for improving water quality. 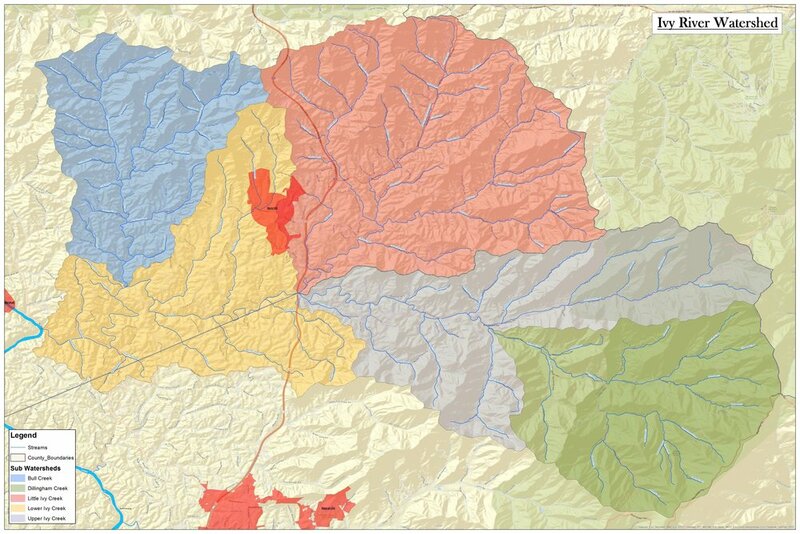 Ivy River Partners uses this plan as a guiding document and continues monitor the health of the watershed. Check out Our Impact and the "What We Do" tab to learn more. For Ivy River Partners, clean water is the goal and cooperation is the strategy. Our partnerships between federal, state, and local agencies as well as private and non-profit entities, serve to strengthen our impact. Mountain Valleys RC&D facilitates this partnership and procures grant funding and donations to put projects on the ground to improve water quality. To learn more about Mountain Valleys, click here. Other partners past and present include the Environmental Quality Institute, Mars Hill University, Madison County Landfill, Madison County Schools, Madison County Cooperative Extension, NC State Extension, Natural Resources Conservation Service, Mainspring Conservation Trust, Asheville Greenworks, RiverLink, Community Housing Coalition, and more.